First up, I hope you all like the new look. I've been thinking the 'black' look we had before was a little depressing so I've been playing around with Blogger templates to see if I can improve matters. It's a bit work in progress at the moment but I think it's an improvement already. Back in the real world, despite the dry weather this week there's not been a lot of time for alotment'y things, although fingers crossed for getting up there tomorrow evening. Everything in the greenhouse has been growing merrily though including, almost without me noticing, our first cucumbers of the year. 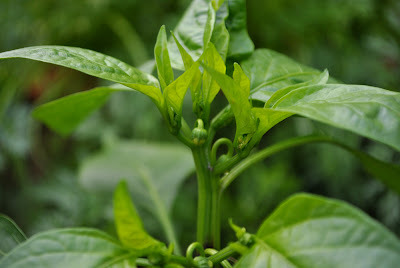 The chillies are doing well in their new pots too, one looks on the verge of flowering already infact. I potted up all the squash, courgettes and marrows over the weekend and they seem to be settling in well. 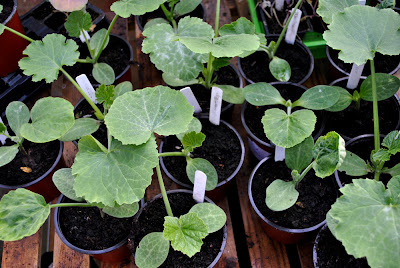 I've managed to do far grow many squash again this year. We grew about eight plants last year which, with the benefit of hindsight, was just about the right number in terms of lasting us through the winter. This year I seem to have fourteen plants, so I think I'll be looking to re-home five or six of them in the next couple of weeks. Rather than end this post on that slightly sour note I'll finish with a picture of a rose from the bush in our garden that suddenly seems to have burst into flower this week. On a brighter note, all the veggies are looking great. Your cucumbers and peppers are doing really well, very ahead of the game!! I like the new look of the blog. I daren't fiddle around with my blog as I'm scared of losing everything, I'm not very technically minded. Sorry to hear about the break in, there's always some who want what you've got but won't work for it. 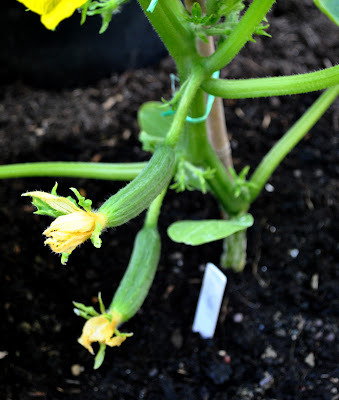 Can't believe you've got cucumbers already, mine are a way off yet.